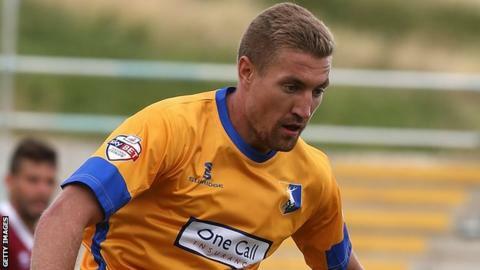 Torquay United midfielder Simon Heslop says this summer has been the hardest he has known to find a new club. The former Stevenage and Oxford player has signed a deal to stay at Plainmoor until January after being released by Mansfield at the end of last season. "It's getting harder and harder every year," Heslop told BBC Sport. "I've played a lot of games as a professional footballer and this is the headrest it's been in the summer to get another club." Heslop, 28, initially joined Torquay on non-contract terms after Luke Young was ruled out for the season with a knee ligament injury. "I've always spoken a lot on the pitch and hopefully I can help some of the younger players and it means it's even more important to communicate on the pitch than it normally would be," Heslop said. "I've played for the manager before and I know what he's about, so he was a big factor in me coming here. "Financially I know the club is struggling, there's no secret behind that, we've just got to pull together as a group and make sure we get the results on the pitch."